Per a previous post of Ryan’s and some comments about the now-defunct band Submersed, this week’s featured band is a supergroup called Eye Empire. Eye Empire’s lead singer is Donald Carpenter, who was Submersed’s vocalist before they sadly disbanded. This fact sparked my initial interest in Eye Empire, as I think Carpenter has a truly spectacular, flexible voice; he does everything from falsettos to raw screaming. The rest of Eye Empire’s lineup has Will Hunt on drums (Hunt has played or is currently playing in several bands that include Dark New Day, Black Label Society, Crossfade, and Evanescence), B.C. Kochmit on guitar and backing vocals, and Corey Lowery (formerly of Dark New Day and Stereomud) on bass and backing vocals. Garrett Whitlock, Submersed’s ex-drummer, had been the band’s initial drummer, and Dixie Duncan had previously been the band’s guitarist. Both left Eye Empire in late 2010. Despite their newness (the band first formed in 2009) and lineup changes, Eye Empire appears poised to make some noise in the hard rock/alternative metal world. With a voice like Carpenter’s, any band should make it big, which is why it is so perplexing that Submersed couldn’t sell. Eye Empire, when compared to Submersed, adds a little more bite in some of their songs, and seems a little more varied in their overall sound. They have released only one album thus far, titled Moment of Impact. This was a limited release of 1,000 copies; a full release is planned for sometime later this year. What I have heard thus far is very intriguing, and definitely deserves my (and your) attention. Do I think this is a better group than Submersed? Not yet (that’s nothing negative; I was/am a HUGE Submersed fan), but with more material and more listens, I can see myself really getting into this band. 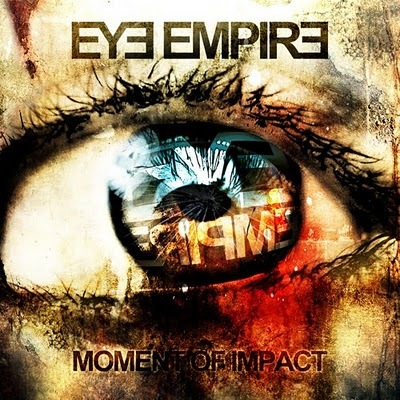 My favorite Eye Empire songs right now are More Than Fate (my initial favorite), Reason (a somewhat softer song), Victim (featuring guest vocals from Sevendust’s Lajon Witherspoon), Ignite (a very heavy yet dynamic song), and I Pray. Click on the titles to hear these songs for yourself, and be on the lookout for more news about the full release of Moment of Impact later this year! I should give this band more of a chance. I expect them to live up to the greatness that was Submersed, but that’s not fair. I just listened to “Reason” and was very impressed.